Daily photographs taken during the month of March 2013. Day 90: Easter Sunday - Mar 31. Happy Easter to everyone celebrating this holiday to to everyone who feels the joy of spring and the hope and sense of renewal that it brings. Thanks to those who commented on my skyline posts recently. 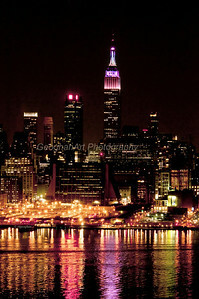 Day 89: NY Skyline Easter Colors - Mar 30. On my way home from dinner with friends, noticed the beautiful reflections in the Hudson River of the Empire State Building Easter colors and other bright city lights. Wound up taking our my tripod and camera and photographing at midnight long after I'm usually asleep. 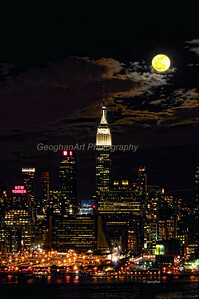 Day 88: NY Skyline Moonrise - Mar 29. 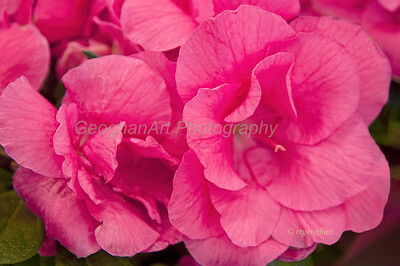 Day 87: Pink Azalea Flowers - Mar 28. Grabbed this show of beautiful azalea flowers in a plant shop yesterday. 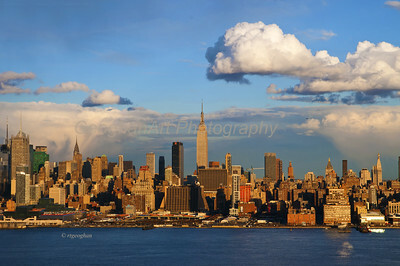 Thanks to all who commented on my NY skyline post yesterday - apprecaite it. .
Day 86: NYSkyline Sundown Clouds - Mar 27. 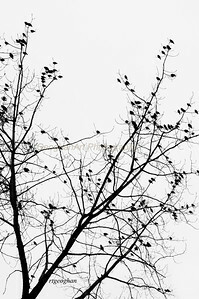 Day 85: Silhouette Birds and Branches - Mar 26 Snow and rain filled white sky yesterday was the backdrop for this silhouette of a flock of birds perching on a tree. Best seen in large size. 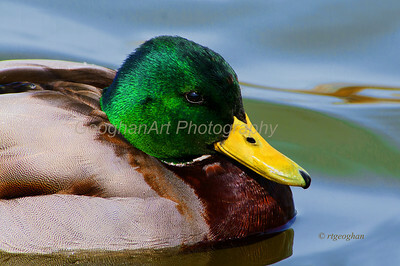 Thanks to all who commented on my mallard photo yesterday. Day 84: Duck Portrait Mallard Drake - Mar 25. 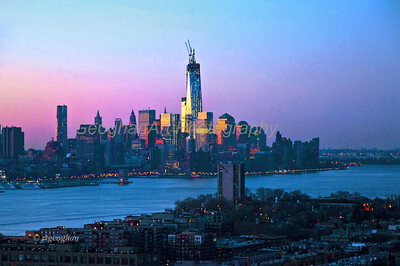 Day 83: NYSkyline Dawn - Hudson River, Lower Manhattan, Hoboken- Mar 24. View of Hoboken NJ in foreground, Hudson river and Lower Manhattan (One World Trade Center) in background in morning's first light. Beautiful colors by sun just coming over the horizon East of the city. Day 82: NYSkyline Dawn - Cruise Ship Carnval Splendor - Mar 23. Woke up early and couldn't get back to sleep. 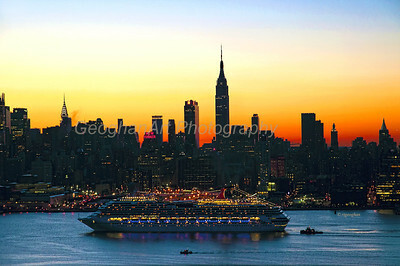 Thught I'd try for a sunrise photo and caught this cruise ship arriving in New York just after dawn. 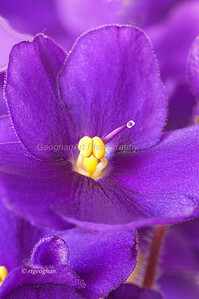 Day 81: African Violet Blossom - Mar 22. 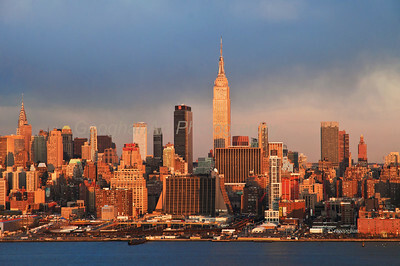 Day 80: NY Skyline at Sundown - Mar 21. A few hours of blue sky starting late afternoon yesterday provided the opportunity for beautiful sundown light. Today, back to clouds and dreary weather. 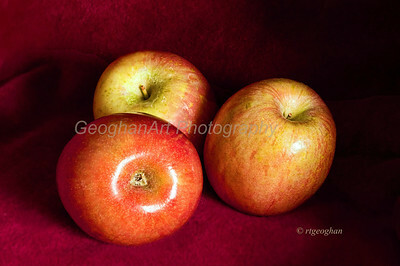 Thank you for the kind comments posted for my apple still life image yesterday. Day 79: Three Apples - Mar 20. Happy first day of Spring. Day 78: Abstract - Mar 19. 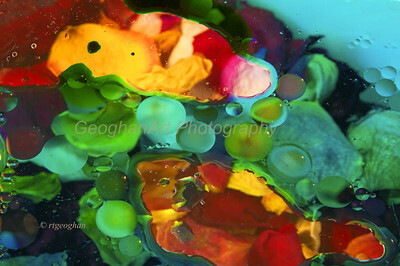 Some abstract play yesterday on a rainy, cold, snowy day. Can't believe that this time last year I was taking daffodil and Spring bud photos. This year no sign of Spring weather or flowers. 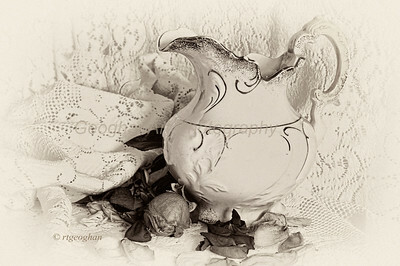 Day 77: Pitcher, Lace and Rose Petals - Mar 18. A bit of nostalgia yesterday remembering my Irish grandmother, her sisters, and the lace and old wash basins and such that they had in their homes built at the turn of the century. 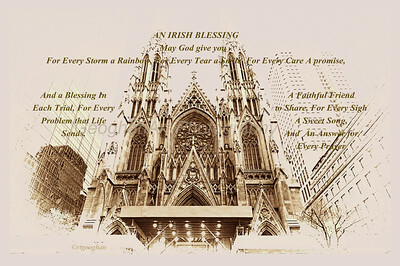 Day 76: St Patricks Cathedral NYC - Mar 17. Happy Saint Patrick's Day everyone. 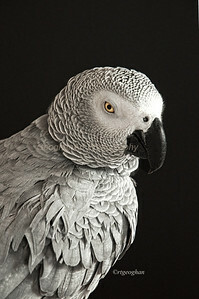 Day 75: African Grey Parrot - Mar 16. This is Clancy Bird, my African Grey Parrot. He was named in honor of his human family's Irish heritage so I thought he should have his portrait taken for St Patricks Day. He didn't quite agree so his feathers are a bit ruffled. Definitely camera shy. Day 74: Pink and White Rosebud - Mar 15. 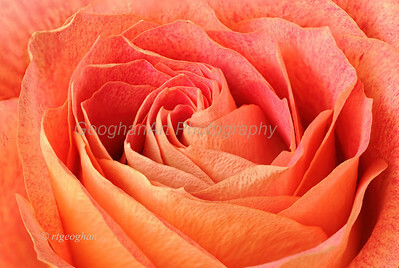 The last of my rose bouquet photographs. Shot yesterday in window light with white board reflector. 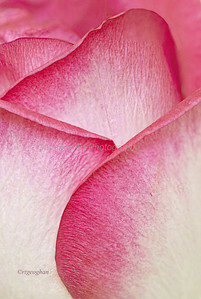 This is a three layer focus stack to be able to get the sharp edges and the texture oof the rose petals. Thanks for the comments on the yellow rose image from yesterday. Day 73: Yellow Rose - Mar 14. Another of the roses from a multicolored bouquet that I purchased from the supermarket the other day. 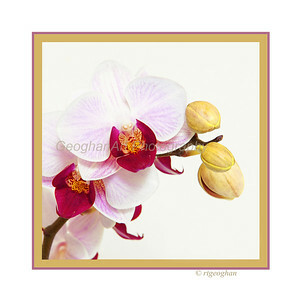 This one with pretty gold petals on the top side and a blush pink on the underside. Unfortunately, most of the dozen have drooped over without ever opening. But happy that a few opened up nicely. 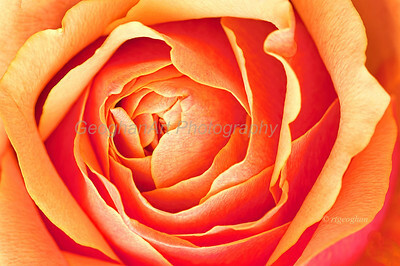 Thanks for all of the thoughtful comments on my rose image yesterday. Day 72: Peach Rose - Mar 13. Rain, rain and more rain yesterday. It was an inside photo day - fortunately had this beautiful rose to work with and enough window light to get a few shots. Hopefully soon we will start to see flowers outdoors. Thanks for all of the comments on my black and white post yesterday. 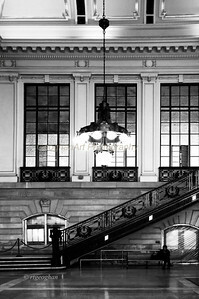 Day 71: Erie-Lackawanna Terminal Waiting Room Hoboken NJ - Mar 12. After severe flood damage from Superstorm Sandy, this old and loved train and ferry terminal in Hoboken reopened about 3 weeks ago. Fortunately the beautiful old lighting fixtures and iron railing in the Greek Revival style Waiting Room appear to be undamaged, But all of the lovely old wooden benches and shoeshine stand are boarded and covered up. Don't know how badly they were damaged or if they can be restored. Even though the Wiaiting Room is open, all of the lower level ticket windows are boarded up and have not reopened. A close look at this image wll show that all of the lower level windows are covered with plastic and sealed. The terminal serves more than 50,000 commuters daily who use trains, PATH, NJ Light Rail, bus and ferry services. 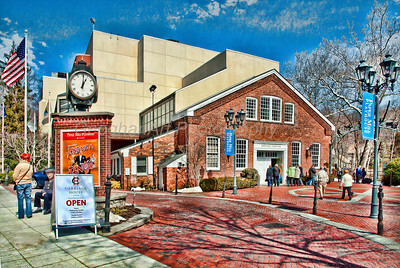 Day 70: Paper Mill Playhouse NJ - Mar 11. One of the most well know repertory theatres in the New York, New Jersey metropolitan area, the theatre gets it name from the Thistle Paper Mill which was the original building on this site, opening in 1795. The papermill functioned for over 20 years until a fire destroyed the business. It was rebuilt and changed hands serveral times, contiuing to be functional until 1928. In 1934, the old mill was purchased and renovated, with the intent of creating a permanent repertory theatre. The Paper Mill Playhouse presented its first performance in 1938 and with the exception of a 2 year down time due to a fire and reconstruction, it has continued to offer musicals, comedies, drama, performances by N.J. Ballet and other events. Over the years, endless numbers of well-know screen and stage performers have appeared in productions here. The Paper Mill sponsors a well regarded training program with such graduates as Anne Hathaway, Bob McClure and Laura Benanti. Each summer a talented group of young aspiring performers attend the Paper Mill Summer Musical Theatre Conservatory program which culiminates in a Conservatory New Voices concert. It was designated as the "State Theatre of New Jersey" in 1971. 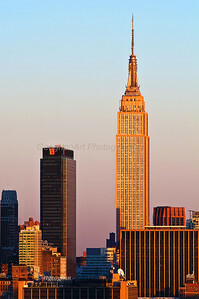 Day 69: New York Sundown - Mar 10. So nice to see the sunshine yesterday and a beautiful sundown. 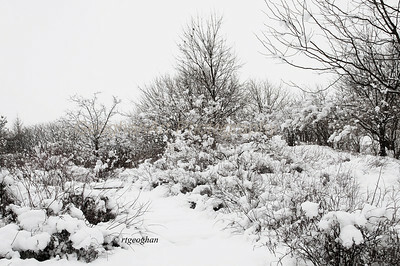 Day 68: Last Snow - Mar 9. By the time I got out just after noontime yesterday, the snow was already changing to rain and disappearing from the treetops. It looked like a black and white world.